Jul. 5, 2013 10:00 a.m. Fully geared up, Teegan sits atop one of his Kawasaki shortly before heading out to compete in a race. Not many people already know what they want to be when they grow up by the age of 7, but Leduc teen Teegan Williams is not "many people". Seventeen year old Teegan has already made a name for himself in his chosen sport which is the highly competitive and rough and tumble world of motocross racing. A very young Teegan first saw motocross on tv and became so excited about the sport. With the help of his dad he ran his first race on his 7th birthday and has been hooked ever since. "I had no idea what I was doing when I entered that race," confessed Teegan with a smile, "and I didn't win but I had a lot of fun!" and ideally that's what any sport should be about. Apparently it was so much fun that Teegan began to take his riding very seriously, and in a sport where the average rider turns pro sometime between 18-24 years old, Teegan again raced ahead and turned pro at sixteen! Now Teegan has two racing bikes, a 250F and 450F Kawasaki that he races in different classes. He currently trains with Ryan Hughes of Ryno Power and travels across Canada and the U.S. to race, including spending anywhere from 1-4 months in the States over the winter. When asked why he wanted to turn pro at such a young age Teegan replied that even though it's much tougher to compete on the pro circuit he wants to take his riding as far as he can go, and he acknowledges that this sport is a young mans game. "It's really hard on your body." Admitted Teegan. "I've already broken my femur, an ankle, two wrists, my radius, ulna, and had a few concussions from riding." But despite the setbacks and physical pain he plans to continue racing for many years to come. "My biggest goal is to get onto a factory racing team." Confessed Teegan. 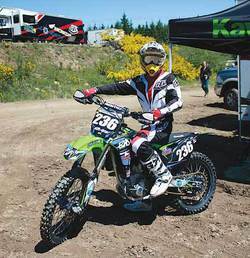 "My dream team would be to get on the Leading Edge Racing Team out of Kamloops. They have the best gear, bikes, and riders on that team. I'm hoping I can make it on there a year or two from now." Part of getting onto that team would be for Teegan to get highly ranked in the top 100 of his sport which means competing and placing in a lot of races all across the country. Since he has only been pro for a very short while he is not ranked yet, but seeing his drive and determination that will only be a matter of time. Teegan recently competed in his third Pro National race at Castrol Raceway which he deemed a "big accomplishment" but was unfortunately unable to finish his race for unknown reasons at this time. He emphasized that as much as he loves the sport, he could never have gotten as far as he has without the care and support of his family and sponsors. "I really want to thank my mom and dad (Tara and Colin Williams) and my little brother Brodie and the rest of my family for all their support." Said Teegan. And as with any sport played at a very high level it is very expensive to maintain everything necessary to compete, so Teegan also wanted to express his gratitude to his sponsors Troy Lee Designs for his gear and equipment, Pro Circuit Racing for his motors and suspension, Camex Equipment, Inland Industrial Supply, VP Racing Fuels, and Echo Cycle Edmonton for all the support they have given to help him attain and maintain his career so far.